Movies used to be better. Click here to play! Sure, they didn't have fancy special effects or digital sound, but they didn't need them did they? A solid script with good actors and a passionate director could become one of those great Sunday Classics of yesteryear. In those films you knew who was good and who was bad. Men were men who pined after delicate beauties and femmes fatales. They were heroes who would come to the rescue of their ladyloves and never let evil men prosper by standing idly by. Those Sunday Classics left you feeling better about the world and that good people with a true love will always win out in the end. 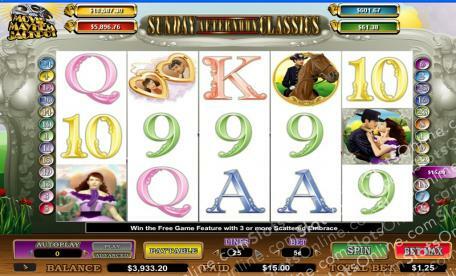 Playing the Sunday Classics slots brings those feelings back. What the hero try to win the heart of the lady, and see if you can't just get your own happy ending by winning the jackpot prize. The Embrace symbol is the scatter, paying out on the total bet when 2 or more land on the reels. It also triggers the bonus game when 3 or more land on the reels. The Lady symbol is wild, and it can substitute for any symbol other than the scatter symbol. The bonus game is triggered when 3 scatter symbols land on the reels. It consists of 10 free spins, and all prizes are tripled.